Course Content: Emphasis is on current scientific understanding of global environmental change and dynamics of the Earth System, particularly climate change and other anthropogenic influences on terrestrial and marine ecosystems. Topics include: detection and attribution of climate change – the physical basis and effects on ecosystems; ocean acidification; wildfires and tropical forests of Amazonia; crop production, food security and human health; adaptation and mitigation options; climate change policy; integration of observations and models to verify greenhouse gas emissions in support of international climate agreements. Students for whom the course is intended: Graduate students in forestry, ecology, biological sciences, environmental sciences, atmospheric sciences, marine sciences, and those interested in global change science and policy. 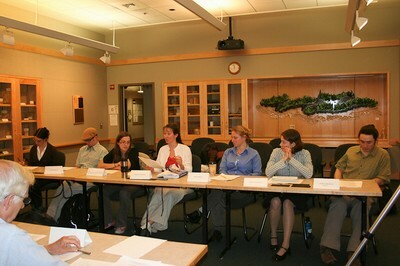 Students participate in a mock Senate hearing for their final exam.